Mounted Police.... "Don't Horse around with Drugs!" Open only to currently active and retired Mounted Police Officers. Save the Denver Police Mounted Patrol ,Denver, Co.
click image for larger photo Washington, DC – January 20th. Mounted Police and Military Mounted units from all over the country participate in inaugural parade. Three charged with assaulting police horse PROVIDENCE,RI – Three Middletown women have been charged with animal cruelty after police said they assaulted a patrolman’s horse. The incident occurred Friday(7/14) when a mounted patrolman was trying to clear the crowd of people spilling out of downtown clubs. A woman started petting the horse but then her companion, Karyn Schiliro, 21, hit the mare so hard in the rear that the animal kicked out, nearly striking two passers-by, police said. When the patrolman threatened to arrest Schiliro, the young woman just laughed and hit the horse again, police said. Then another woman, Lindsay Kircher, 21, hit the horse with a pizza box and a third woman, Tammy Polley, 20, hit the horse in the head with a soda can. 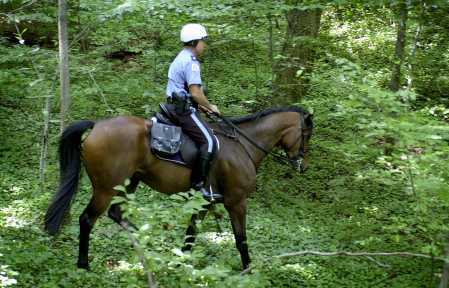 After a short chase, the mounted patrolman and another officer caught the women and arrested them. The horse, named Fleet, was not seriously hurt. Butler County Ohio Through private donations Sheriffs Mounted Patrol acquires a military caisson similar to the ones used at Arlington National Cemetary. This first in the nation endevour is to honor fallen Police and Firemen. Also recieved by Butler County was two Black English shires from the 3rd Infantry Guard at Arlington Cemetary. The horses were donated through the Federal Surplus Equipment program. This was the first time horses had ever been redistributed. The National Law Enforcement Officers Memorial was dedicated in 1991 by President George Bush. It honors all of America's federal, state and local law enforcers. Inscribed on the Memorial's blue-gray marble walls are the names of more than 14,000 officers who have been killed in the line of duty, dating back to the first known death in 1794.